I never went to a screening of The Room. Coolidge Corner Theater has midnight screenings a couple times throughout the semester, and rumor has it Tommy Wiseau and Greg Sistero have made surprise appearances in the past. Now that I’m graduating, I have only 1 goal: to get a cameo as Mike in James Franco’s Disaster Artist, the movie about the movie about nothing. Rumor has it Dave Franco, Seth Rogen, Kate Upton, Josh Hutcherson, and Zac Efron have all signed on, and I think I’d fit right into that cast. · Tommy Wiseau claims to have financed the film by importing and selling leather jackets from Korea. He refuses to further elaborate on this. · Shot simultaneously on 35 mm film and high-definition video. Tommy Wiseau was confused about the differences between the formats, so he used both cameras on the same mount. He also purchased the cameras, instead of renting them as film productions usually do. · Mark (Greg Sestero) is named after Matt Damon. According to Sestero, Tommy Wiseau misheard the actor’s name despite his obsession with the actor. · Entire scenes were out of focus because nobody bothered to check the lens. To check out the Coolidge’s schedule of screenings, you can click here. Don’t make my mistake and graduate without experiencing The Room gloriously projected onto the large screen. The mid-semester slump is real. The stretch between Columbus Day and Thanksgiving can start to feel like you’re on mile 25 of a marathon. Luckily, there are some easy tips and tricks you can do to keep yourself motivated and your spirits high. It sounds cliché and boring, but give it a try. Stand up from that desk you’ve been sitting at all day, and just go for a walk. Doesn’t have to be long, can just be down the street. But while you’re on that walk, let your mind wander. Maybe think about the fact that in a month, there will be a new Star Wars movie. A brand new Star Wars. Directed by J.J. Abrams. There’s nothing like having your favorite comfort food on a cold fall day. No matter what it is, your favorite food will always put you in a better mood. Maybe it’s some mac and cheese, or maybe it’s some tomato soup as red as Kylo Ren’s lightsaber. Did you see that thing? Remember in the first trailer when he lit it up and we were all like “oh, ok,” but then the crossguard lit up and we were like “WHOAAA?? ?” Yeah, we’ll get to see more of that in a month. Over 2 hours of it. How awesome is that?? It’s been scientifically proven that exercise will improve your mood and energy. It’s hard sometimes to get the motivation to go in the first place, it seems like the last thing you want to do is get all sweaty and tired like John Boyega was in that first Force Awakens trailer. Why was he dressed like a Storm Trooper though? I mean, obviously it’s been what, 30 years since the originals? So they clones can’t be the troopers anymore, but is he a rouge trooper? The later trailers make it seem like he’s a good guy, so maybe he was in disguise like Luke and Han in Episode IV? It’s easy to get so caught up in work, you forget to just get out and have fun. And nobody likes that friend who’s never around, kind of like how Luke Skywalker hasn’t been in any of the posters or trailers. Where is he? Did he turn to the dark side? There was that one shot in the first trailer where we saw R2D2 and somebody with a robotic hand, maybe that was him? He lost his right hand in Empire Strikes Back so it totally could be him, but we didn’t see his face so who knows. Also, how cool was it that they used the voiceover from Return of the Jedi? Super cool. The film student’s dilemma: I want to go to the theater, but dropping $10 every time I want to see a movie doesn’t exactly mesh with my “broke college student” budget. The solution? The magical world of pre-screenings. You’ve probably gotten emails from the Film/TV department about a couple, but if you keep an eye out, a good amount of movies will have free promotional screenings a few weeks before they come out in theaters. Most of the time they do them to build hype, so the most you’ll have to do is fill out a slip with what you thought of the movie. Advancescreenings.com – Similar to Gofobo, but it seems like gofobo usually has a longer list. Facebook – A lot of studios have on-campus reps, and they’ll have Facebook pages like Universal at BU or Warner Bros. at BU. They’ll post about screenings that are exclusive to BU students, so just bring your ID along and you’re good to go. An added bonus of some of these screenings is that actors/directors will come along and do Q&A’s sometimes, so you can do a quick write-up and count it as a cinematheque. (Plus bragging rights to your friends when you get a selfie with actors.) You’d be surprised by the amount of big-name movies that have screenings—so far this semester I’ve gotten to see Black Mass and The Martian, and Steve Jobs is having one at the theater by the common this Thursday (10/8). 2. Music: I also had to admit to myself that playing music while studying is a bad idea. I spend too much time singing along in my head or making a new playlist, and all the sudden I’ve wasted half an hour. The exception I’ve found is my soundtrack station on Pandora. Added bonus is that homework feels a lot more important when the Dark Knight theme song is playing in the background. 3. Know your enemy. (Too dramatic?) Going into half a semester’s worth of readings without a gameplan is never helpful. Taking a minute to look at the syllabus and come up with a plan makes it a lot more manageable. I always try to rank the readings by what I think will be on the test, and start with those first. 4. Bring everything. Before I leave my room I make sure I have all the chargers I need, books, notebooks, etc. If I leave something behind I usually use it as an excuse to leave the library and head back. 5. No Internet! Admittedly I’m terrible with this one. It starts with one “I’ve been studying for a while, quick Facebook break” and next thing I know I’m taking Buzzfeed character quizzes for shows I don’t even watch. Don’t do it. Stay strong. You’re better than Buzzfeed. Growing up, I was a diehard Red Sox fan. I remember my town announcing that they were going to convert our little league field into a mini-Fenway park was pretty much the highlight of my life. I remember arguing with my mom until I finally convinced her to let me stay up to watch the Sox win the World Series in ’04. I remember Jason Varitek signing my baseball and that ball might as well have been gold to me. So for me, living down the street from Fenway is a dream come true. I think baseball fan or not, everyone needs to have a Fenway experience and go to at least one game. This year I went with my roommate to “Dollar Beard Night” and we ended up cutting up my bed sheet to make fake beards, taping them to our faces, and getting into the game for a dollar. (The Sox lost, but it was still one of the best nights of the year so far). Now that it’s fall and the Sox are in the playoffs, (sorry Yankees, you tried) there’s so much going on around Fenway. The other night, David Ortiz hit a grand slam to pull the Sox back from a 5-1 deficit and I could literally hear the crowd from my dorm. Any time I want to go walk down Yawkey and look at all the banners and posters, it’s just a couple blocks away. Fenway is easily one of my favorite parts of Boston, and to anyone who says they’re not a baseball fan, just try it. Go to one game. I guarantee you’ll get some awesome memories out of it. 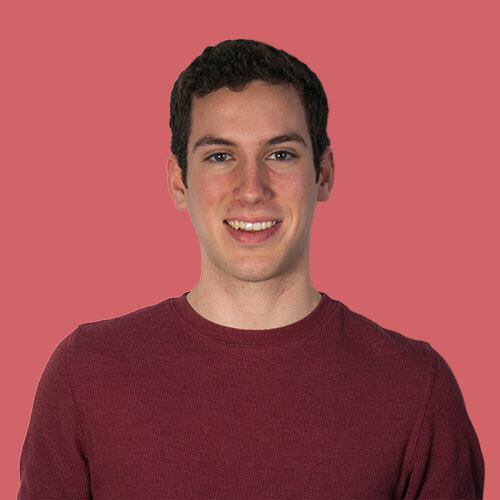 Posted on October 17, 2013 October 16, 2013 Categories Activities, Boston, Kevin, Places On CampusLeave a comment on Kevin: Go Sox! If it’s anything worth saying, don’t say it over text. Obviously email and texting is great and helps us all stay in touch, but can also be very unclear. This summer I’m doing an internship with Crisis Response Journal, a magazine based out of the UK that deals with disasters and emergencies around the world. Last week I went down to NYC to meet with the editor, Emily Hough, who was incredibly helpful and nice. Until then we had only talked over Skype and email, and getting to meet her in person was great. We were able to cover things in just a few minutes that would’ve taken dozens of emails to talk about, really making me a firm believer that if something is important, talking it out in person is more than worthwhile. Over email, sending lots of questions can get overwhelming, but being able to ask her about little things in person and bring up specific things on the computer I had questions about made me feel much more confident that we were on the same page. That being said, sometimes email is unavoidable, so another lesson I’ve learned is to take time writing your emails! Read through it a few times and try to make it as clear and concise as possible, so that you don’t have to waste the next few emails clarifying! Can’t wait to meet COM 2017 in the fall, hope you guys have an awesome summer! Enjoy orientation! Now that the weather is getting nice, it’s the perfect time to get out and explore Boston. So why not go get some pictures taken at famous movie locations around Boston and make your friends jealous? There are plenty of places around Boston you could visit for this one, but the best place to snap a picture has to be the bench where Robin Williams and Matt Damon sat while Robin Williams earned his Oscar. You might’ve seen this movie, but I’ll bet you can’t tell me what it smells like in the Sistine Chapel. Maybe this movie wasn’t as iconic as other Boston movies, but you won’t have to go far to find some famous spots. A lot of this movie was actually filmed on BU campus, so you could head over to the basement of Mugar library, where Jim Sturgess studied, or the BU castle, where the alumni event scene was filmed, or even over to Towers, where his dorm was. The majority of the interior scenes were actually filmed at BU, not MIT, so there are plenty of places to spot in this one! So the bar technically wasn’t IN the TV show, but it did inspire it, so that has to count, right? 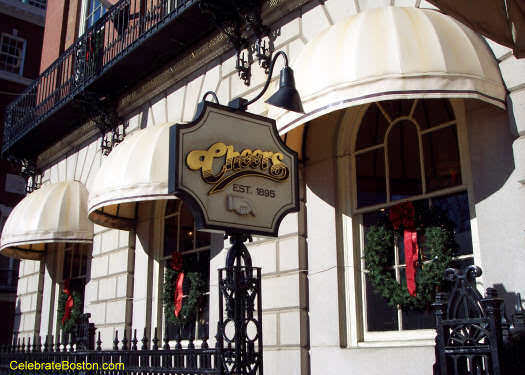 At 84 Beacon Street, right off the common, you’ll find the bar the famous sitcom was named after (don’t get fooled by the one at Faneuil Hall, that one was made later). 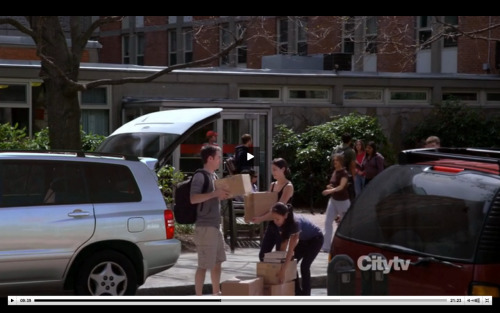 In the episode where Haley is being moved into college, the exterior shot of her dorm is actually BU’s Towers. Wonder if she ran into Jim Sturgess at all? Another one from Ben Affleck, The Town, is filled with Boston locations. If you head over to 111 Dorchester Street in south Boston you can get a picture at Thornton’s Flowers, the nefarious flower shop.